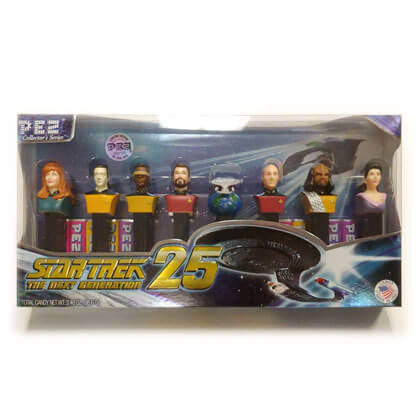 Collectors Series Star Trek pez. Includes 8 candy dispensers featuring Worf, Beverly Crusher, Geordi La Forge, Jean-Luc Picard, William T. Riker, Data, Deanna Troi and the U.S.S. Enterprise. Also includes 12 candy cartridges. Candy net weight 3.48 oz.